Britain's largest police force is operating covert surveillance technology that can masquerade as a mobile phone network, transmitting a signal that allows authorities to shut off phones remotely, intercept communications and gather data about thousands of users in a targeted area. The surveillance system has been procured by the Metropolitan police from Leeds-based company Datong plc, which counts the US Secret Service, the Ministry of Defence and regimes in the Middle East among its customers. Strictly classified under government protocol as 'Listed X', it can emit a signal over an area of up to an estimated 10 sq km, forcing hundreds of mobile phones per minute to release their unique IMSI and IMEI identity codes, which can be used to track a person's movements in real time. The disclosure has caused concern among lawyers and privacy groups that large numbers of innocent people could be unwittingly implicated in covert intelligence gathering. 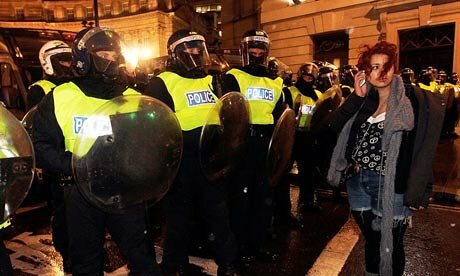 The Met has refused to confirm whether the system is used in public order situations, such as during large protests or demonstrations. Nick Pickles, director of privacy and civil liberties campaign group Big Brother Watch, warned the technology could give police the ability to conduct 'blanket and indiscriminate' monitoring: 'It raises a number of serious civil liberties concerns and clarification is urgently needed on when and where this technology has been deployed, and what data has been gathered,' he said. 'Such invasive surveillance must be tightly regulated, authorised at the highest level and only used in the most serious of investigations. It should be absolutely clear that only data directly relating to targets of investigations is monitored or stored,' he said. Datong's website says its products are designed to provide law enforcement, military, security agencies and special forces with the means to 'gather early intelligence in order to identify and anticipate threat and illegal activity before it can be deployed'. The company's systems, showcased at the DSEi arms fair in east London last month, allow authorities to intercept SMS messages and phone calls by secretly duping mobile phones within range into operating on a false network, where they can be subjected to 'intelligent denial of service'. This function is designed to cut off a phone used as a trigger for an explosive device. A transceiver around the size of a suitcase can be placed in a vehicle or at another static location and operated remotely by officers wirelessly. Datong also offers clandestine portable transceivers with 'covered antennae options available'. Datong sells its products to nearly 40 countries around the world, including in Eastern Europe, South America, the Middle East and Asia Pacific. In 2009 it was refused an export licence to ship technology worth £0.8m to an unnamed Asia Pacific country, after the Department for Business, Innovation and Skills judged it could be used to commit human rights abuses. A document seen by the Guardian shows the Metropolitan police paid £143,455 to Datong for 'ICT hardware' in 2008/09. In 2010 the 37-year-old company, which has been publicly listed since October 2005, reported its pro forma revenue in the UK was £3.9m, and noted that 'a good position is being established with new law enforcement customer groups'. In February 2011 it was paid £8,373 by Hertfordshire Constabulary according to a transaction report released under freedom of information. Between 2004 and 2009 Datong won over $1.6 (£1.03m) in contracts with US government agencies, including the Secret Service, Special Operations Command and the Bureau of Immigration and Customs Enforcement. In February 2010 the company won a £750,000 order to supply tracking and location technology to the US defence sector. Official records also show Datong entered into contracts worth more than £500,000 with the Ministry of Defence in 2009. All covert surveillance is currently regulated under the Regulation of Investigatory Powers Act (Ripa), which states that to intercept communications a warrant must be personally authorised by the home secretary and be both necessary and proportionate. The terms of Ripa allow phone calls and SMS messages to be intercepted in the interests of national security, to prevent and detect serious crime, or to safeguard the UK's economic wellbeing. Latest figures produced by the government-appointed interception of communications commissioner, Sir Paul Kennedy, show there were 1,682 interception warrants approved by the home secretary in 2010. Public authorities can request other communications data – such as the date, time and location a phone call was made – without the authority of the home secretary. In 2010, 552,550 such requests were made, averaging around 1,500 per day. Barrister Jonathan Lennon, who specialises in cases involving covert intelligence and Ripa, said the Met's use of the Datong surveillance system raised significant legislative questions about proportionality and intrusion into privacy. The Met would not comment on its use of Datong technology or give details of where or when it had been used. A spokesman said: 'The MPS [Metropolitan police service] may employ surveillance technology as part of our continuing efforts to ensure the safety of Londoners and detect criminality. It can be a vital and highly effective investigative tool. A spokesman for the Home Office said covert surveillance was kept under 'constant review' by the chief surveillance commissioner, Sir Christopher Rose, who monitors the conduct of authorities and ensures they are complying with the appropriate legislation.